For Mother’s Day Jim and the kids bought me a few vertical succulent garden containers and dozens of beautiful small succulent plants. I had expressed an interest in trying these gardens out, as I’d seen a few really cool ones web surfing and on Pinterest recently. Jim looked around a few nurseries and decided this plastic style seemed to be the best. I liked them in the fact that if one plant dies, it is in it’s own individual cell and the plant can easily be removed and replaced, but once you’re done planting it you still have an ugly plastic container on the outside. 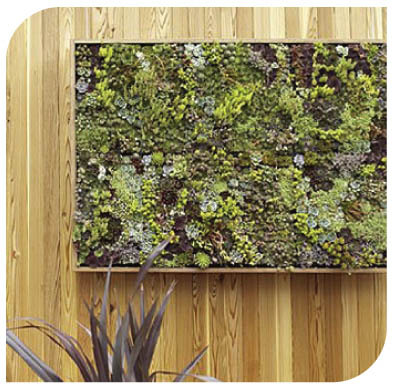 I saw in my research for this post that Home Depot is selling a frame for these Grovert wall gardens, but at $139 a piece that’s a pretty stiff price tag for a small garden frame. 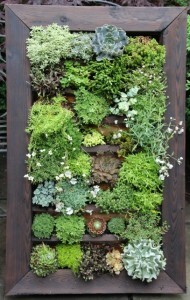 This amazing vertical garden (below) and the one shown top left is actually made from many Grovert garden panels put together into one big frame. Jim had said that there were other options, so I went to check them out and came home with this unfinished pine wood frame very similar to a style I had seen on Etsy. 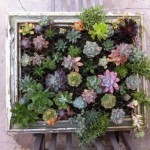 It’s a hand made frame that was available at a local nursery. 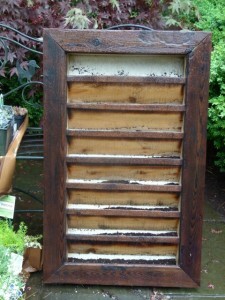 So now I had a garden frame I generally liked that was a better size, but it was still ugly. In my constant daydreaming of moving to a bigger, better and larger farm, I am always working on the design of this house in my head. 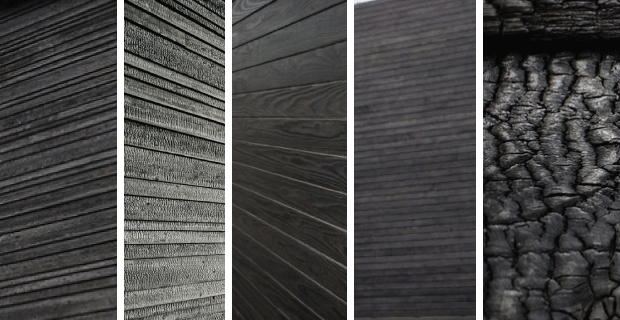 Not too long ago I came across a very unusual Japanese wood treatment called Shou-Sugi-Ban. 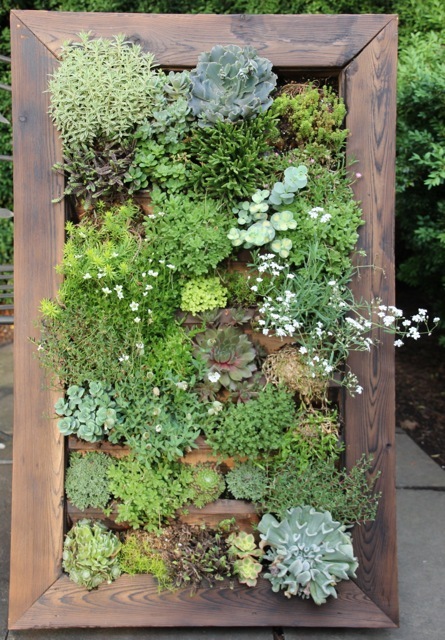 I’d love to incorporate some of this into my new farmhouse someday. 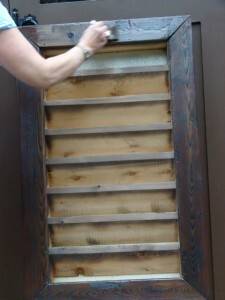 Shou Sugi Ban is an ancient Japanese exterior siding technique that preserves wood by charring it. 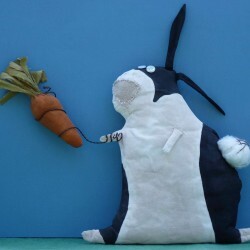 Traditionally, Sugi, or Japanese Cyprus, was used. Here in the U.S. you'll find Douglas Fir, Cyprus, and Oak species used. 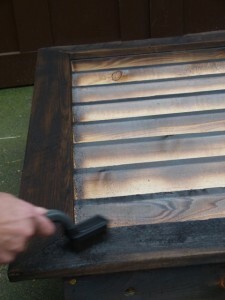 The process involves charring the wood, cooling it, cleaning it, and finishing it with a natural oil. Although time consuming, the final product is not only gorgeous, with its rich, silvery finish; the charred wood also resists rot, insects, and fire and can last up to 80 years! 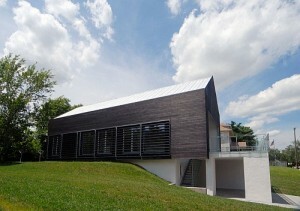 A house using Shou-Sugi-Ban burned wood siding. 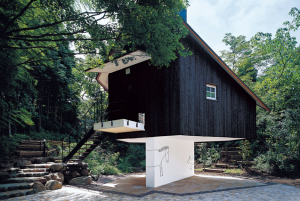 Another house constructed using Shou-Sugi-Ban burned wood siding. 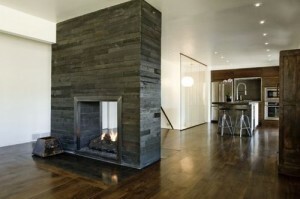 This fireplace was surrounded with shou-sugi-ban burned wood siding. I love this look. Since it’s hard to even find much information on it, and there are only a few suppliers of it to be found in the U.S., I figured I could always do it myself when it comes time to build my dream house. This seemed like the perfect opportunity to give it a whirl. I had the hose on and ready along with a full spray bottle of water at hand for putting out any stubborn flames. Using my torch attachment and a small propane tank (you can get these at any home improvement center), I started on the sides of the frame in case it really was a disaster. I started on the back of the frame. It took a little playing with to figure out exactly how much burn seemed to be the right amount, but you really want it to burn the entire surface of the wood. 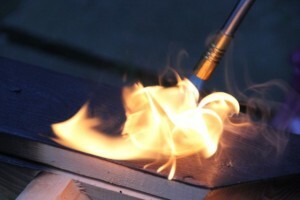 You really want to burn the entire surface of the wood. When I was finished with the sides I felt comfortable enough to move on to the front of the frame. I didn't burn the inside planting areas as I knew those would be covered with dirt and plants. 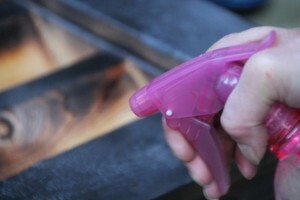 Sometimes it took a squirt or two from the spray bottle to get a fire out. 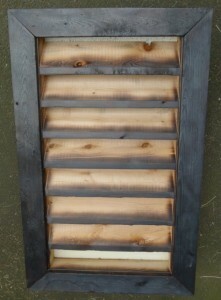 Here is the frame all burned but not yet finished. The frame is all burned but it's not finished yet. Using the softest wire-bristled brush you can find (I think that might be an oxymoron? 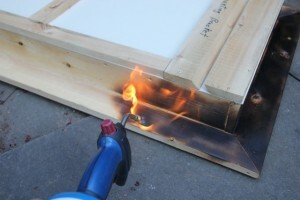 ), gently scrape away most of the burned ash. The next time I do this I’m going to find an even softer brush as I really loved the color of the burned wood – a black silvery gray color. 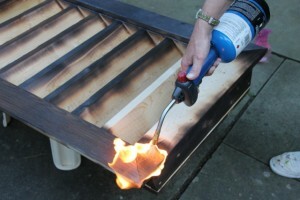 Using a wire brush, scrape away most of the burned ash. This is what it looked like after I’d scraped away most of the ash. This is what it looked like after I'd scraped away most of the ash. The last step was to finish it with a clear sealer. 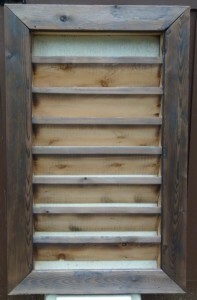 I used a clear decking stain; I’m not sure that is what you would use for a house siding application, but it seemed good enough for a garden planter. 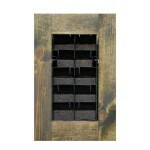 I’ll research it some more before I go finishing my farmhouse siding. 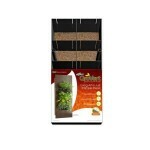 Now to plant it. I used a soil mixture of quality topsoil and lots of vermiculite to make it nice and light. The finished frame is ready for planting. All done! Now I’ve just got to figure out where to hang it. I really planted this in my head for my new farm house. I just can’t seem to find the right spot for it here. And this is what it looks like just a few weeks later. 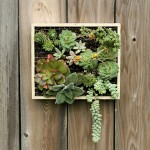 I think we’ve had perfect weather conditions for succulents – not too hot and lots of moisture. And this is what it looks like just a few weeks later. I love the way such a simple treatment really changed the frame so much. 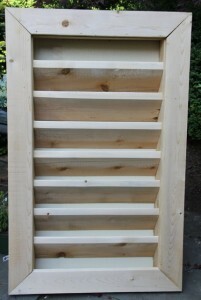 Now I’m going to make some frames for the 3 plastic Grovert containers Jim bought me. There is no way I’m paying $139 for those. I’ll let you know how much I save.